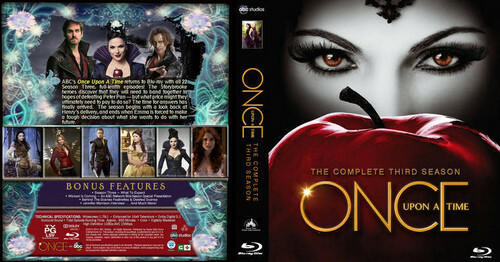 Cover art for Season 3 DVD and Blu-ray. . Wallpaper and background images in the once upon a time club tagged: photo once upon A time season 3. This once upon a time photo contains anime, banda desenhada, manga, desenhos animados, mangá, and quadrinhos. I love it! Probably because it's Regina's face. This is a legit image of the DVD's right? If this is the actual thing I'd be so disappointed; for one, there are loads of main characters besides Regina and they all had quite a big part in season 3 both parts (except Belle and maybe Neal) AND this is a promo pic of Regina from season 1! Seriously? Can't they at least make it season 3? It is legit - I have looked it up. And the front COVER is definitely legit cause - its on pre-order sites. Fieryrubes, it's probably because they made season 3 seem like two different seasons. The other two seasons both had the same plot in each episodes that it was easy to come up with cover art for them to use for the seasons. Season three doesn't really have that because it feels like two different season in one, which is what the writers wanted. Yeah, they could have done that. I also don't get that on the back they used old promo pictures of the characters, besides Ariel of course. But I understand why Regina is the main focus of the cover art because she does seem to have the biggest development and the most action. She's the one who comes up with how to get the box from Gold's shop to Neverland, saves Henry, gives Emma and Henry new memories while saving everyone else from Pan's curse by taking them home, saves Charming's life when Snow sacrificed his heart, got Henry to remember, and defeated Zelena by using light magic. It feels like she's the protagonist this season instead of Emma. @KataraLover they could have been more inventive, but it's not that big a deal I guess. Like Alchemistlover said about Neverland and Oz. @Fieryrubes Wasn't that from season 2? @Alchemistlover that's a pretty cool idea. No the one of Regina on the front is of season 1.